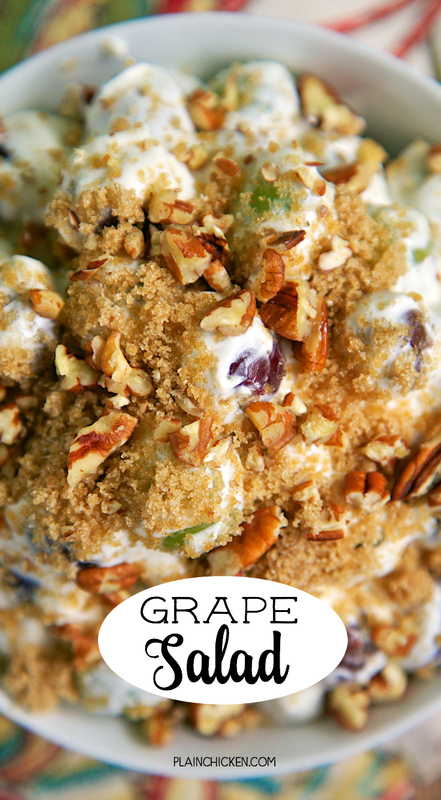 Copycat Chicken Salad Chick Grape Salad - this stuff is like crack. It is SO good! 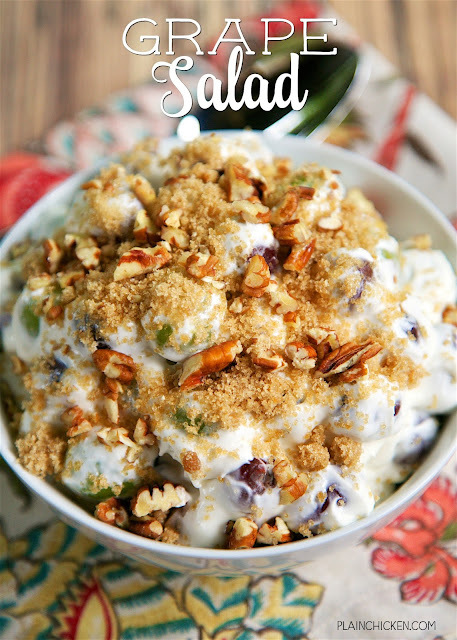 Cream cheese, sugar, vanilla, sour cream and grapes topped with brown sugar and pecans. Perfect for a crowd - brunch, baby shower, office potluck, cookout, tailgating, holiday breakfast. SO easy and CRAZY good! Can make ahead and refrigerate. This Spring I went to an Auburn University Woman's Football Camp with my friend, Becky. It was an all day event held at the University Athletic Complex. Aubie was there, along with all the football coaches. We got to hear from an SEC football official, the University equipment manager, the coaches spoke and we ran plays with the Offensive Coordinator and Defensive coaches. It was a lot of fun. It was actually really interesting to hear what goes on during the week in football season. Let's just say that I am glad I am not a football coach. I think Coach Mahlzon only sleeps about 4 hours a night during the season. No thanks! For lunch at the football camp we were served Chicken Salad Chick. It is a hometown company and people love their chicken salad. The only disappointment with the meal was that there was no Grape Salad. Everyone was talking about how good it was and that they were sad they didn't serve it at lunch. I've never eaten Chicken Salad Chick's Grape Salad, so I went in search of a recipe. I found a post on the Internet that said it was the official recipe straight from Chicken Salad Chick. It headed to the store to get the ingredients. I followed the recipe exactly except I added a good bit more grapes. The original recipe had way too much cream cheese mixture and not enough grapes. I went back to the store for more grapes and that made it perfect. Let me tell you, this stuff is like crack. It is SO good! 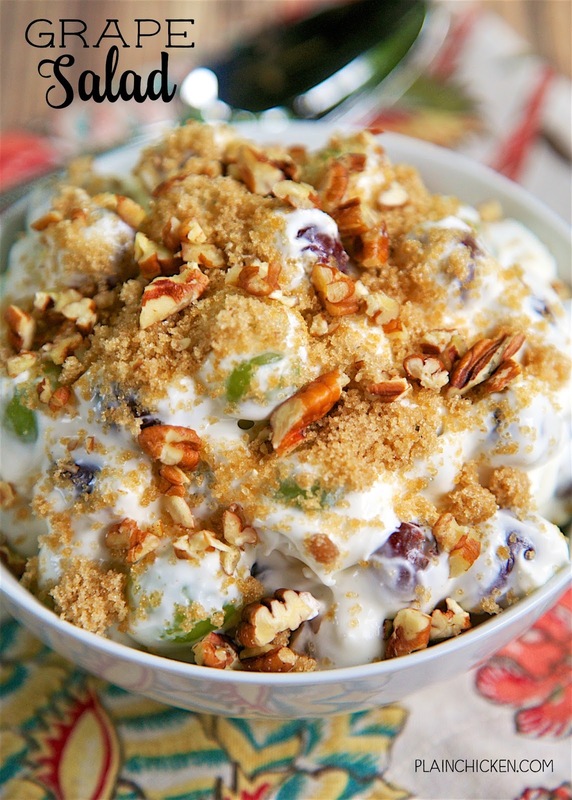 Cream cheese, sugar, vanilla, sour cream and grapes topped with brown sugar and pecans. This is my kind of salad! This makes a lot, so it is perfect for a crowd (brunch, baby shower, office potluck, cookout, tailgating, holiday breakfast). Make it today - you won't regret it! Wash grapes and remove stems. Dry completely. In a large bowl, beat cream cheese with a handheld mixer until completely smooth. Add sour cream, sugar, and vanilla. Mix for 2 minutes on medium speed. 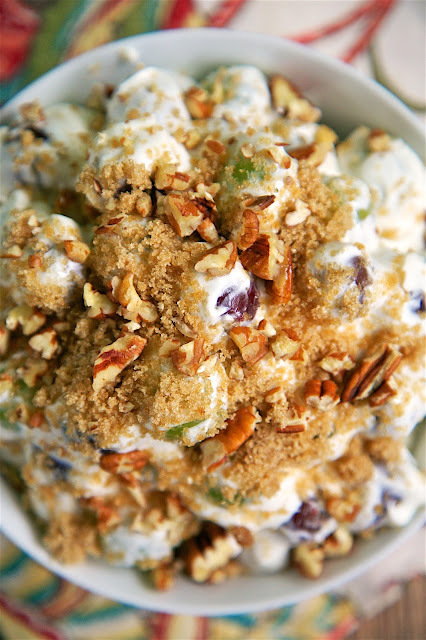 Add grapes to cream cheese mixture and gently mix by hand until all grapes are covered. Cover and chill until ready to serve. ust before serving, sprinkle pecans and brown sugar on top of grape salad. I think that "chicken salad chick" is the company that makes this? but the name is grape salad? This is NOT a chicken salad recipe - it is a GRAPE salad recipe. It is a side dish from the restaurant Chicken Salad Chick. They may have a chicken salad recipe with grapes, but it is not this one. I would NOT add chicken to this sweet side dish/dessert. Chicken Salad Chick's version is a CHICKEN salad with grapes...it also has chopped celery...sounds like if you add Chicken and celery to this one, it will be great. This is NOT a chicken salad recipe - it is a GRAPE salad recipe. It is a side dish at the restaurant Chicken Salad Chick. They may have a chicken salad recipe with grapes, but it is not this one. I would NOT add chicken to this sweet side dish/dessert. This stuff is addicting! My favorite side to get at Chicken Salad Chick! It's perfect with their chicken salad sandwich. Chicken Salad Chick's GRAPE SALAD is phenomenal. I cannot wait to go home and make this! Thank you! 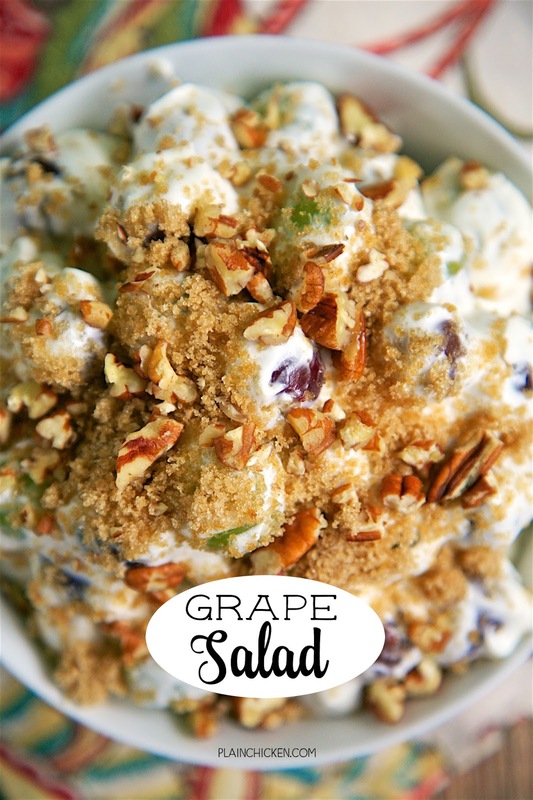 I had this grape salad today and it is amazing! I went straight to the store to get the ingredients. I'm making it as a side for lunch after church tomorrow.